So I was going to do a comparison review of the two MMOs Star Wars: The Old Republic and The Secret World, since they both came out roughly the same time, and I've been playing them both, but since I've completed TOR with 2 characters and not yet completed the first TSW main quest line with a single character I decided to hold off until I have done a bit more with TSW. Suffice to say I really like both of them and I've never max levelled a character in any other MMO Evar! But since comparing them without completing one would be unfair I will throw another Of 52 in your face. 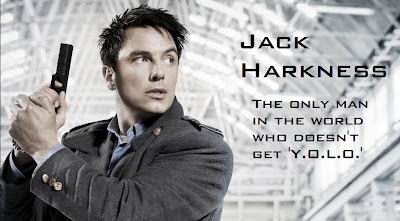 Captain Jack Harkness, the 51st century man, first appeared on our screens back in 2005 in the Doctor Who episode 'The Empty Child. He started out as a con man, trying to trick members of a time agency into buying an alien war ship, but it backfired when the 'war ship' turned out to be an ambulance filled with nanites that were transforming the population into inhuman monstrous weapons, based on the profile of one dead little boy. Jack brightened up the episode with a menagerie of one liners and sexually inexplicit innuendos that we hadn't been getting from Rose and the Ninth Doctor. At the conclusion of the two-part episode Jack lost his space ship trying to do the right thing, teleporting a missile on board and flying away. He was saved from the explosion by the doctor, at which point Jack become one of the Doctors faithful companions... for three episodes, at which point he is killed by a Dalek, brought back to life for all eternity by a time-vortex-addled Rose Tyler and promptly left behind to use his time agent issue vortex manipulator to travel back to the mid-19th century, where he waited until the BBC gave him his own TV show, Torchwood, set in modern day Cardiff. The Torchwood series wasn't amazing, but it had Jack in, which brightened it a lot. He's funny, sarcastic and just a little bit cheeky, he made the series watchable, and the finale of season two - his back story, go watch - was really good. The main reason I liked Jack, however, wasn't that he was a fun interesting character, funny but at the same time very sad, very old and very, very human - though he was all those things, and it's hard not to love him for them - I liked Jack because of his time with the doctor. He was half as smart as the doctor (which is still considerable), he worked with the doctor like a friend and ally not some little girl that the doctor carried around to show off to, but despite his relative seniority he still showed the doctor respect, reverence. It's also the reason I hate River song. They've written her as his equal, but she's not as smart, she isn't as interesting and she just doesn't respect him. "Only the doctor can save us, but still I'm going to insult him, put him down and make people laugh at his expense along the way!" Jack was useful, when they stormed the control room of Satellite five the doctor didn't tell him what to do, he just did it, he was the one who figured out that the laser guns were teleports, not the doctor - don't get me wrong the doctor could have, but he had other things going on. My point is that if it was Rose or Martha, or Amy or Rory, hell even Donna who was my favourite full time companion that had gone up there with him they would have just stood next to him and watched, not gone off, found the TARDIS and figured it all out. If you haven't watched Doctor Who season 1 and 3 or the first three seasons of Torchwood I implore you to do so, because you're missing out. Even if you only watch the episodes with Jack in you'll be doing yourself a favour.